THE VOTE: How long will David Beckham last with LA Galaxy? 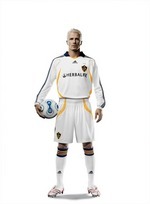 Months and months of relentless hype come to an end on Friday 13th of all dates, as David Beckham will be officially unveiled as a Los Angeles Galaxy player today, at 6pm. He will be paraded, like some very expensive pony, before a select audience of season-ticket holders and special guests. About time too, because let’s face it, hype means nothing in football. The question is, how long do you think Becks will last in LA? I can see him staying for a season, not being an overwhelming success – how much can one 30something right-sided midfielder change a mediocre team’s fortunes? – and then buggering off back to Europe. What’s your call? You forget that Tom Cruise, his new best friend, has brainwashed him already. His new mission is not to legitimize the MLS, but to fly the spaceship back to Xenu. He will stay until contract end, and after he retire he will promote MLS to other soccer superstars.